Hammurabi receiving the laws from the god Marduk or Shamash. Below them is written Hammurabi's code of laws. Hammurabi (Akkadian from Amorite ˤAmmurāpi, meaning "the kinsman is a healer," from ˤAmmu, meaning "paternal kinsman", and Rāpi, meaning "healer"), was the sixth king of Babylon from 1792 BC to 1750 BC. He became king after his father abdicated, and was the first ruler of Babylonia. By winning wars against other kingdoms in Mesopotamia, Hammurabi created a large Babylonian empire. However, his son Samsu-iluna and later Babylonian rulers lost much of the land he had gained. Hammurabi is most famous for his laws, which are known as the Hammurabi's Code. Hammurabi's Code was one of the first written codes of law in history. Hammurabi became king of Babylon in around 1792 BC, when his father Sin-Muballit abdicated. Babylon was one of many small independent cities in ancient Mesopotamia. These cities often fought each other for control of land. Babylon was already one of the more powerful cities when Hammurabi became king. Earlier kings of Babylon had taken over the nearby city-states of Borsippa, Kish, and Sippar. Hammurabi did not fight any important wars in the early part of his reign. He instead improved the buildings of Babylon. He built taller city walls to make the city more difficult to attack, and expanded the temples. In around 1771 BC, the kingdom of Elam attacked Mesopotamia from the east. Elam invaded Eshnunna, a city-state to the north-east of Babylon, and destroyed its cities. It also tried to start a war between Babylon and Larsa, a city in southern Mesopotamia. However, Hammurabi instead made an alliance with Larsa against Elam. Hammurabi defeated Elam, but felt that Larsa had not given him enough help. He therefore attacked Larsa. Babylon had entirely conquered southern Mesopotamia by c. 1763 BC. 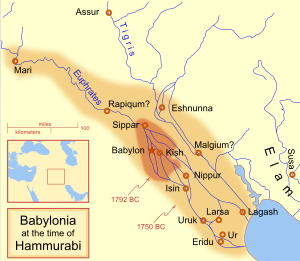 Hammurabi's allies in northern Mesopotamia had sent their armies to the south to help Babylon. This caused unrest in the northern area. Hammurabi therefore returned north, stopping the unrest, and defeating Eshnunna. He then attacked and conquered the remaining cities in northern Mesopotamia, including Babylon's former ally Mari. It is possible that Mari surrendered to Babylon without any fighting happening. After this, Hammurabi was in control of most of Mesopotamia. Only Aleppo and Qatna, two western cities in modern Syria remained independent. When Hammurabi died in c. 1750 BC, his son Samsu-iluna became king. ↑ Jaynes, Julian (1976). The Origin of Consciousness in the Breakdown of the Bicameral Mind. Houghton Mifflin Company Publishing. ISBN 0395207290. ↑ Arnold 2006, p. vii. Van De Mieroop 2005, p. 1. His date of birth is unknown. ↑ Beck, Roger B. (1999). World History: Patterns of Interaction. Linda Black, Larry S. Krieger, Phillip C. Naylor, Dahia Ibo Shabaka. Evanston, IL: McDougal Littell. ISBN 0-395-87274-X. OCLC 39762695. This page was last changed on 22 January 2019, at 17:36.